Cubaism maintains contracts and good relationships with major car hire companies in Cuba including Rex, Havanautos, Cubacar and Via Rent A Car. During Easter Bank Holiday our London & Havana offices are closed from Friday 19th to Monday 22nd April. All application made from Thursday 18th April after 4.00 pm will be processed on 23rd May; UK Next Day delivery orders will be delivered on 24th May. 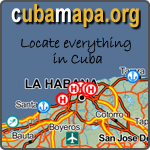 • Automatic medium category cars with insurance included, pick up & drop off in Havana (Vedado). Please email sales@cubaism.uk with your travel dates if you wish to make a booking. There is no price available for this car! Please Note: GPS devices are not allowed in Cuba.